Melanie Mundell, a UD alumna who teaches at the Newark Charter School, has been selected as the 2016 Delaware Bio Educator of the Year. 8:40 a.m., May 12, 2016--Melanie Mundell, a University of Delaware alumna, has been selected as the 2016 Delaware Bio Educator of the Year for grades K-12 by the Delaware BioScience Association (DBA). The DBA recognizes exemplary individuals and organizations for their contributions to Delaware’s bioscience community. The DBA Educator of the Year for K-12 honors teachers who implement innovative science, technology, engineering and mathematics (STEM) curriculum or programs in their schools. 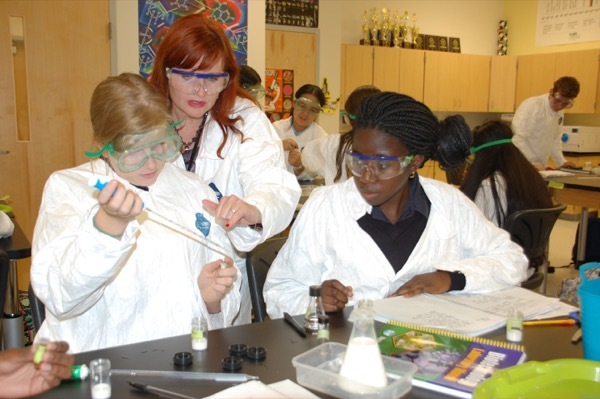 With the help of a $79,000 grant from a national foundation, Mundell, a high school biotechnology teacher at Newark Charter School, has pioneered the four-year Biotechnology Pathway in Newark Charter’s STEM Academy. The program integrates core academic courses with specialized knowledge and skills in biotechnology. In this way, it provides students with a pathway to postsecondary education and careers in the field. Mundell teaches courses on heredity, genetics, DNA and the human and plant genome, as well as the ethical, economic and environmental impact of biotechnology. Through hands-on laboratory experiences, students learn about DNA fingerprinting, cloning and HIV detection. Because the biotechnology pathway is also classified as an agricultural program, students become members of the National Future Farmers of America (FFA). They learn about the history of the FFA, complete a Supervised Agricultural Experience, and earn the FFA’s Greenhand Degree. Some students also compete in the FFA’s state and national Agriscience Fair. This year, five of Mundell’s students placed in the top 10 of their events at the national competition in Kentucky. Shu-Jin Kust, an 11th grade student, placed second in the nation with her long-term research project on soybeans. To develop the program, Mundell researched classroom approaches and curriculum design with leaders in the biotechnology and education fields. Mundell was presented with the award on April 20 at the 2016 Delaware Bio Awards Gala. Nearly 300 leaders from industry, academia, government, and medical research institutions attended. Several other awardees with UD ties were honored during the gala.